Major General Lawrence W. Steinkraus was deputy director for operations (command and control), the Joint Staff, Organization of the Joint Chiefs of Staff, Washington, D.C.
General Steinkraus was born in 1922, in Cambridge, Massachusetts. He entered aviation cadet training in March 1942 and received his pilot wings and commission as second lieutenant in February 1943. He graduated from Florida State University with a bachelor of science degree in industrial management. He is also a graduate of the Advanced Management School at the University of Colorado. He served as a flying instructor and B-29 pilot during World War II. In 1946 he was assigned to the 97th Bombardment Group, Salina, Kansas, and received a regular commission that same year. He then was transferred to the 1st Air Reserve Unit at Hensley Field, Texas, as operations officer, and while there the unit won the award for the most active Air Force Reserve unit in the country. In June 1948 General Steinkraus was transferred to Guam and assigned as a B-29 aircraft commander and instructor pilot for the 19th Bombardment Group. He returned to the United States in September 1949 and served as a B-29 and B-50 bomber engineering test pilot at Robins Air Force Base, Georgia, and Eglin Air Force Base, Florida. In November 1950 he was assigned to the newly established Air Force Armament Test Center at Eglin as chief, manpower and organization, and later served as the deputy chief of staff. In October 1953 he went to Smoky Hill Air Force Base, Kansas, and was operations officer and then wing inspector for the 40th Bombardment Wing. He stayed with this organization through conversion to B-47 aircraft and then left in 1955 under the Air Force Institute of Technology program to attend the Advanced Management School at theUniversity of Colorado. From September 1956 to August 1959, General Steinkraus served as a B-47 pilot and then commander of the atomic test squadron at Kirtland Air Force Base, New Mexico. During this period, he participated in the initial drogue development work on atomic weapons. He took the squadron to Eniwetok in the Marshall Islands for atomic testing in 1958 and stayed as the commander of Eniwetok Air Base. General Steinkraus returned to Eglin Air Force Base in September 1959 and became chief of the Training Division for the 4135th Strategic Wing, a newly organized B-52 wing, and later served as director of operations. In July 1962 he was assigned the same duties with the 4138th Strategic Wing at Turner Air Force Base, Georgia. In July 1963 he was assigned to Eighth Air Force, Westover Air Force Base, Mass., as chief, Operations and Training Division, later served as deputy inspector general and then inspector general. In June 1966 General Steinkraus was assigned to the Organization of the Joint Chiefs of Staff in Washington, D.C., as an action officer in the Directorate of Operations and became assistant deputy director for operations. General Steinkraus was assigned as commander of the 319th Bombardment Wing, Grand Forks Air Force Base, N.D., in January 1968; commander of the 379th Bombardment Wing, Wurtsmith Air Force Base, Michigan, in August 1968; and commander of the 22d Bombardment Wing, March Air Force Base, California, in April 1969.
munitions, logistics plans and logistics analysis throughout the Strategic Air Command. In November 1972 General Steinkraus assumed duties as deputy director for operations, command and control, Operations Directorate, Organization of the Joint Chiefs of Staff. His military decorations and awards include the Distinguished Service Medal, Legion of Merit, Joint Service Commendation Medal, and the Air Force Commendation Medal with two oak leaf clusters. He is a command pilot. He was promoted to the grade of major general effective August 1, 1972, with date of rank July 1, 1969. 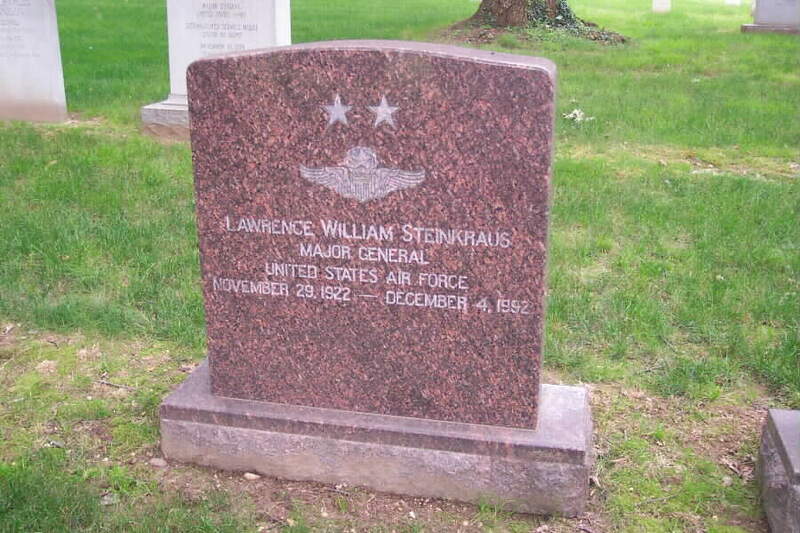 General Steinkraus was buried with full military honors in Section 30 of Arlington National Cemetery.